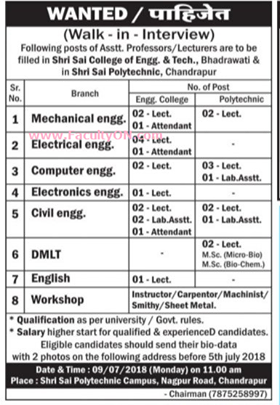 Shri Sai College of Engineering and Technology, Bhadrawati has advertised in LOKSATTA for the recruitment of Assistant Professor/Lecturer jobs vacancies. Interested and eligible job aspirants are requested to apply with in 5th July 2018. Check out further more details below. About College: "SHRI SAI COLLEGE OF ENGINEERING & TECHNOLOGY" was established in 2008-09 by the renowned Society/Trust in Vidharbha Region named Late M. D. Yergude Memorial, Shikshan Prasarak Mandal, Chandrapur (M.S.) SSCET is approved by A.I.C.T.E. New Delhi, D.T.E. Mumbai, Govt. of Maharashtra and affiliated to Gondwana University, Gadchiroli & R.T.M. Nagpur University, Nagpur. SSCET is the Imperial College to get the Prestigious International Standards ISO 9001:2008 Certification for Promoting and Maintaining Excellence in Technical Education.